As a therapist, I know how essential it is to mood and functioning to by well rested and eat healthy food. I worked hard in graduate school and early in my career, often sacrificing sleep, but once I prioritized sleeping a sufficient number of hours each night, I quickly realized that I was able to accomplish more and the quality of my work improved. I was convinced how critical sleep is. Like many internationally adopted children, when we arrived home my son had difficulty sleeping through the night. He had been through so much transition and crossed the international date line in addition to several time zones. While it was totally understandable that he would wake at night, I was not used to night-waking and the fatigue wore on me quickly. I read articles online and put a hold on the books at my local library that had information about sleep training for older children. The first book offered little other than assurance that I was doing all that I could. 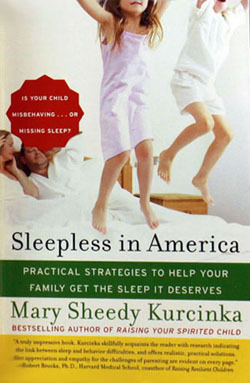 Sleepless in America: Is Your Child Misbehaving or Missing Sleep (Practical strategies to get your family the sleep it deserves) by Mary Sheedy Kurcinka though is a book I will happily recommend to any family concerned about fatigue, falling asleep, and staying asleep. In addition to strategies for sleep training Mary discusses how fatigue, even in children who do not seem tired, can create misbehavior in children. She helps parents become more aware of the many factors impacting their children and teach children to be aware of their own physical needs. Simply reading the book is a great reminder of positive ways that we can speak to children. In some ways, I think it can go hand in hand with the Connected Child in teaching children to be aware of their physical and emotional needs and helping parents learn how to discover and meet those needs. Her examples demonstrate that it is never too early to talk to children rather than at them. I felt understood, supported, and empowered so much in the first few chapters that we found a sleep strategy with long term goals that works for us and attends to his emotional needs and my physical needs. It still took several months before I could sleep straight through the night very often, but most of our nighttime wakings are now very short-lived. Besides, it is normal for children (and adults) to wake several times at night; some children simply need a bit of assistance to drift back to sleep. Mary explains how small changes throughout the day can make a major impact on a child’s ability to fall asleep and how parents can prevent potential problems. I found it really interesting how she could predict times when a child would likely have more trouble sleeping through the night. I am not calendaring the times my son may sleep less well (although she makes a good point on why you should), but just knowing there are predictable reasons can help make it easier to manage.